Home Forum Winchester Rifles M1886 .50-105 factory rechambered to .50-110??? This is beyond my understanding. Seems nicely museum letter verified. But I had thought the .50-100, .50-105 and .50-110 were all the same chambering and all used the same case - just different powder charges and bullet weights? How could the factory rechamber a .50-105 to a .50-110? Clearly the barrel has not been replaced. Looking forward to the answer as I am scratching my head. I do understand the rate of twist is probably different among the .50-100, .50-105 and .50-110, but this makes it all the more intriguing as to why (or how) Winchester would rechamber a .50-105 to .50-110. I'm still not understanding what could be rechambered? And they couldn't change the rate of twist without replacing the barrel. I’d do an inquiry with Cody, wouldn’t be the first fake letter. I doubt the twist rate or chamber is different between a 50-105 and the 50-110. I believe that the only difference is the powder charge? The 50-100 has the 450 bullet and the twist rate could be different. A faster twist stabilizes heavier bullets. I think the chamber is still the same. Remember the OAL of these 3 still has to be about the same to cycle through the receiver. Can't explain why the change was made and most likely a new barrel was put on or the old one had to be re-stamped and then blued again. I looked at the Letter again. No water mark and no embossing. I'd check with Cody as Mike said. Am I reading the Letter correctly? It was changed from a 105 to a 110? If so not so rare anymore. Was the 105 ammo hard to find in these days? This remains very intriguing to me. If you were to fake the letter, why wouldn't you leave off the part about being changed to .50-110? That just diminishes the value. And if you left off the part about the cartridge change - how would anyone know (when theoretically, nothing is different). And, if Winchester changed a chambering from one cartridge to another, they wouldn't restamp it or mark it somehow? The fake letter idea has merit but again, makes no sense including the part about how it is no longer a .50-105. A little more research on my part. To start with, I reviewed Frank Barnes Cartridges of the World and his comments were what I remembered. "Here we have another example of different loadings in the same case causing confusion, as if they had been used in differently chambered guns. 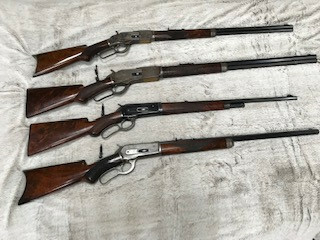 These are all variations of the original 50-110 Winchester, introduced in or before 1916 for the Model 1886 repeating rifle. The original 50-110 was cataloged in November 1887, the 50-100-450 version was offered in August 1895 and the High Velocity version came along sometime after 1910, but is shown in the 1916 catalog. This chambering was also available for the single-shot. Winchester listed cartridges until 1935." Frank does not mention when the 50-105 cartridge became available. I find it interesting that the 50-100-450 was not offered until 1895 and here we have this rifle, a 50-105 made in 1888. So, the 50-105 was available at least 7 years earlier than the .50-100, it would seem? 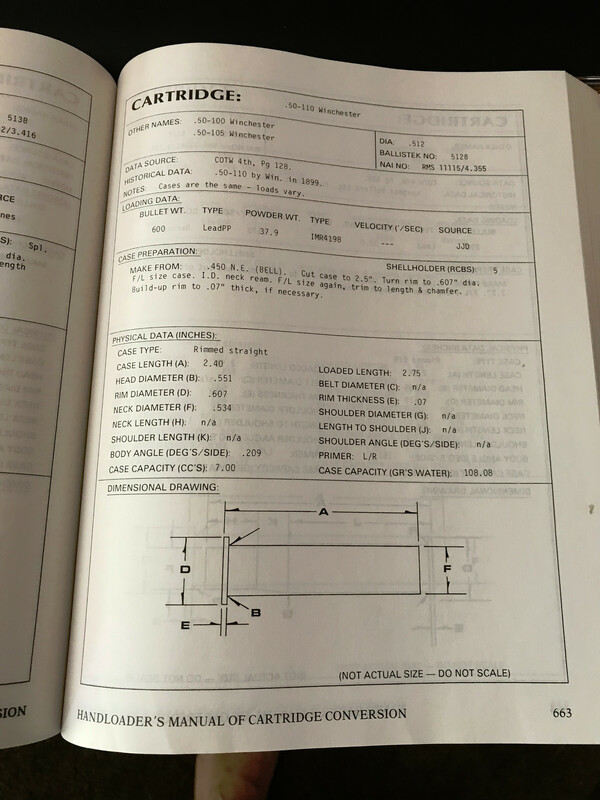 With regard to cartridge dimensions, in Cartridge of the World, there is a section at the end of each chapter that lists cartridge dimensions. In the case of the 50 calibers under discussion here, Frank lumps the three variations together and the dimensions listed are identical for all three. No help there. These measurements suggest to me that these are two different cases. It suggests that the 50-110 is a completely straight-walled case with the same head and neck diameter, while the 50-100 is not a straight-walled case with either a taper or a neck. It also suggests a 50-100 cartridge would slide into a 50-110 chamber while maybe a 50-110 will not slide into a 50-100 chamber. Further it suggests that if Winchester had a request to change a chamber of a 50-100 to a 50-110, some reaming would be required (if whatever reason the decision was made to not rebarrel the rifle). It also suggests that if Winchester had a request to made a chambering change from 50-110 to 50-100, they would have no feasible choice except to rebarrel the rifle. So, for you guys who have 50-100, and 50-105 and 50-110 Winchester rifles, along with factory cartridges for each - can you try the various cartridges in the various rifles? It won't surprise me if there aren't many takers for the above request. However, can I get some takers on what others think of the above information? I know there are some concerns about the originality of the museum letter. In the auction description, they do mention (but don't show) that there is a copy of the factory ledger page included. And again, it sure seems to me that a faked letter would not insert a statement about the rifle having been rechambered. Not that I consider it a great source of data, but Wikipedia lists the neck diameter of the .50-110 as .534. They must have pulled this from somewhere. This implies the .50-110 cartridge would chamber fine in a .50-100 chamber. It really is lost on me what they did to that barrel to change it from 50-105 to 50-110. And assuming they did, why were the caliber markings not changed? Any thoughts at all out there? Here are a couple pictures of a 50-110 and a 50-100. 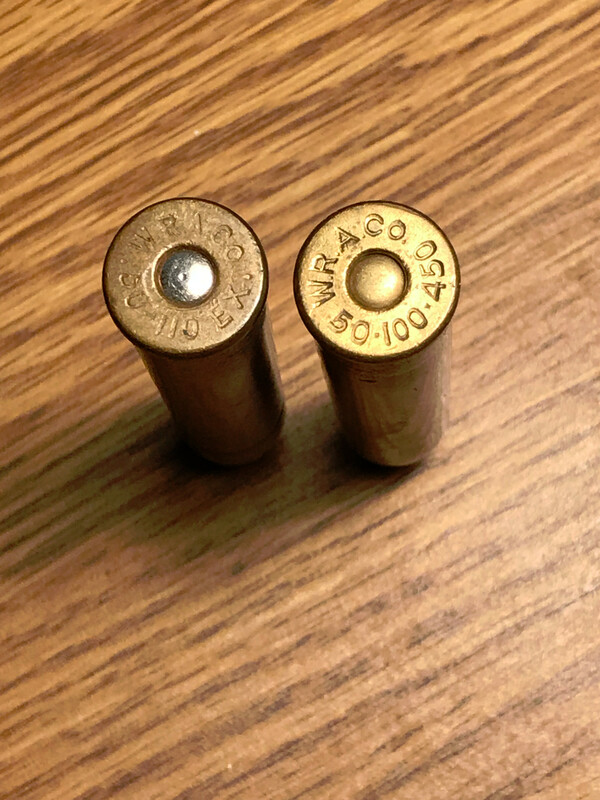 Same length and shape different bullets. I don't have a 105 but they are the same length and shape too. Just less powder. Just for comparison here they are with a 45-90. Thanks for posting those pics, Chuck. I can never seem to get enough of the older cartridges! Thanks to Chuck for the photos as well. Does anyone know the rate of twist for each of the three cartridges under discussion? According to the research material I have, the .50-100 and .50-110 have a twist rate of 1 in 54". I would think the .50-105 would have been the same. I do not believe that the 50-100-450 and the 50-110 EX have the same rifling twist rate. The difference between the 450-grain bullet and the 300-grain bullet is too great, and the 1:54 rate used for the 50-110 is too slow to stabilize the heavier 450-frain bullet. I agree that it doesn't seem correct, but I believe 1 in 54 is on the list in John Campbell's book "The Winchester Single Shot" volume 1. I would not trust everything you read in his book about barrel twist rates. Steve you need to buy Donnelly's book. The Handloader's Manual of Cartridge Conversions. Chuck - thank you for posting. Yes, it looks like a book I should have. I note the page on these cartridges references Cartridges of the World as a source. And, they state this is the same case, just with different loads. 1) We're not completely sure that the rifles chambered in each of these three cartridges have the same rate of twist. 2) We still have no idea how Winchester would take a rifle that had been chambered in .50-105 and alter it to a .50-110. In other words, we don't know what they would do to accomplish that change. As I've stated, if the rate of twist were different, a new barrel would be required to make the change. For the sake of discussion, let's say the rate of twist is identical among these cartridges. 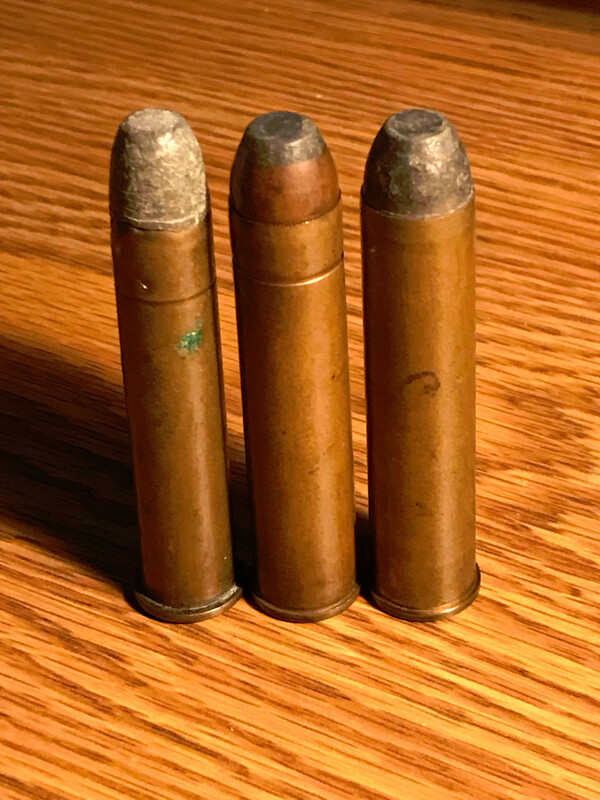 Would it then be accurate to say that the ONLY difference between rifles chambered in these three different cartridges is the caliber stamping on the barrel? Twist rate is a question, but I wouldn't argue with Rick. Who knows why the barrel was changed. Maybe it was bad and 50-110's are the same and plentiful? 105 ammo is rarest and maybe someone thought the barrel had to be changed for 110? Twist rate aside, the only difference is the barrel stamping. From my on-going research regarding Winchester Reloading Tools, I recalled stumbling across this tid bit of information. The "DOW Book" in the McCracken Research Library at the Buffalo Bill Center of the West lists the following. On approx. page number 6 (the pages aren't numbered in the book) between tabs "B" and "C". So it is apparent from the DOW book that the 50-110 & 50-100-450 do not have the same rate of twist. The DOW book does not list the "50-105" caliber. Now granted I've never measured the rates of twist in any of these calibers, but the DOW book is a factory document that is housed in the McCracken Library, so I doubt that it is inaccurate. Very interesting. Strong evidence of different twist rate between 50-100 and 50-110. It sure would be interesting to know the twist rate of the 50-105. In continued to think this through, if someone wanted their 50-105 changed to 50-110, and the factory ledger indicated this was accomplished, why on earth can this rifle still be stamped 50-105? And, short of boring the barrel out and inserting a liner with a different barrel twist, how could any change in the barrel have occurred? How is this rifle not a 50-105 in every way? There are improbable explanations I suppose. The rifle was sent back with the requested cartridge change and a new 50-110 barrel was fitted. Later, someone took that barrel off and put a 50-105 barrel back on. Or, to add the possibilities, the barrel was swapped out as I suggest, the original 50-105 barrel was returned to the owner (it was his after all and he wouldn't like receive any, "trade-in" credit for it). As I think of it, sure if it was me, I'd have the original barrel returned to me with the rifle. And this would answer the obvious question: where would someone have found a 50-105 barrel. As improbable as it sounds, it would explain everything we are seeing. Maverick, the info you provided makes a lot of sense to me. Steve, I didn't realize that the barrel was still marked 105. Maybe the letter/ledger is wrong/confusing. The only difference with the 2 barrels is the marking so they used a 110 barrel and marked it 105. All three, 100, 105 and 110, can be shot in any of the 3 guns. A faster twist won't bother the 300 gr. bullets but the 450 gr. bullets need the faster twist to stabilize. Add Reply: M1886 .50-105 factory rechambered to .50-110?? ?